A Life of Sugar and Spice: It's Friday the 13th again! First, my dinner last night. 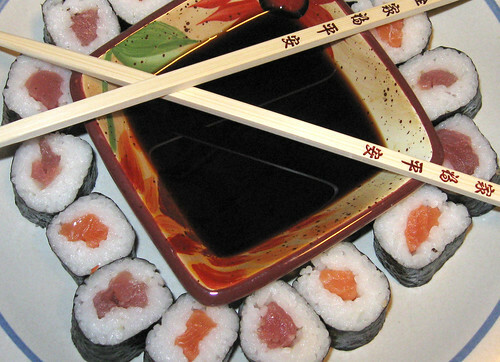 I love sushi but don't eat it very often. Yesterday I just had this huge craving for it! Yummy salmon and tuna sushi with gf tamari. It was the perfect dinner last night. And now, some product reviews! On the left we have some GF/CF chocolate chip cookies that are made right here in Massachusetts. 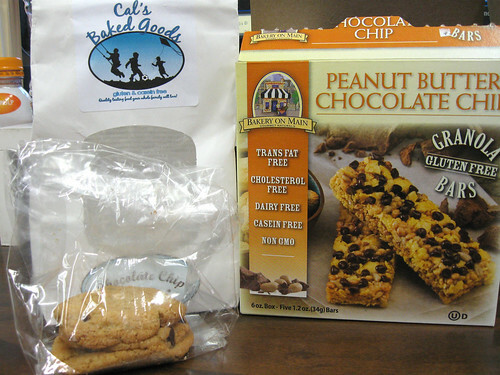 Cal's sells mixes and baked goods that are all gluten-free and casein free, all natural, and absolutely delicious. I first heard about Cal's goodies from Liz when she posted about their cupcakes and I found out that she got them at our local health food store. A few months later, I noticed that they now carry an entire line of their mixes and one night had samples of the baked goods. So far I've only tried these chocolate chip cookies but they are great, just like the real thing. Soft, chewy and delicious! These are not cheap, but I love supporting a locally owned small business. I won't buy them all the time though, as they still have sugar and I'm working on moderation here! On the right we have Bakery on Main Peanut Butter Chocolate Chip Granola Bars - GF/CF. I got these at Roche Bros. supermarket. If you're looking for a granola bar that will break your teeth, order these today! The flavor is good, but boy are they tough to bite into. These would be good to have on hand for emergency situations, but I can't eat them every day. And now that I've found instant oatmeal I don't have to. I don't know if I'll buy these again, like i said, good for emergencies, but not for every day eating. I'm so glad it's Friday, I'm looking forward to a nice relaxing weekend. Going out in my hometown tonight with some old friends that I haven't seen in a long time! The sushi looks amazing. Now I'm craving it! Did you make it yourself or order out? My hubby bought me a sushi kit for Christmas, but I've been afraid to attempt it. I'll have to get up the nerve and do it soon!!! I was watching youtube videos yesterday afternoon to see how to make it myself, but then I ended up ordering it! I wanted to make california rolls with real crab but it was too expensive.